Okay, I got a ton of email that can be summarized “WTF sturgeon!?! ?” (i.e. “What’s the frozen sturgeon?”). I figure I’ve got to offer some elaboration. The ice tunnels branch off from the underground pathway from the beer can to the Logistics Arch. They lead primarily to the Rodwells – one pipe bringing in fresh water from Rodwell #2 and another returning wastewater to fill Rodwell #1. Another branch leads off to Rodwell #3, which is almost ready to come online as our new freshwater source. The tunnels are about 30 or so feet below the surface, and have an almost constant -65C [corrected: -65F, which is about -50C] temperature (I think) year round. Roughly every day, someone needs to go down into the tunnels to check on how full Rodwell #1 (the wastewater hole) is by dropping a plumb line down. The top couple of hundred feet of the teardrop-shaped hole is narrow, so when things get near the top, we need to watch carefully or there’s going to be a crazy foul-smelling subterranean frozen geyser down in the tunnels. And nobody wants that. Anyhow. It’s deep old, permanent ice down there. And some time way back when, people began carving little niches into the walls of the ice tunnels. Don’t know what the first was, but as evidenced by the photos I posted, there are all sorts of little shrines down there. The most famous is the sturgeon. 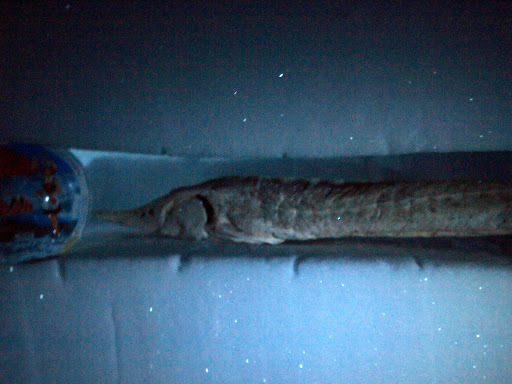 Lore has it that John Wright, who was in charge of the ice tunnels back then, chain sawed out a niche in the tunnel wall where the sturgeon can remain frozen forever – or at least until the patch of ice we’re on hits the Trans-Antarctic range and sublimates 10,000 years from now. Storm’s moved in again. Not a bad one, but visibility’s dropping, and the wind’s picking up. It’s one of the funny things about Polar storms: contrary to what happens on the rest of planet earth, a storm here means that the barometric pressure rises, and everything warms up. Temp is up to -33C already, and we may even get some snow. We really don’t get much snow – the air is so cold that, even fully saturated, it can’t hold enough moisture to put together a decent snowflake. Mapcon news: I’ve asked the materialsfolks if we can make more “Mapcon is not a game” t-shirts. I promise I’ll do some more Questions for Pablo at the Pole this coming weekend. Internet connectivity: the good news is that a replacement for our broken satellite part is scheduled to arrive on one of Friday’s Herc flights; the bad news is that we’re expecting the Herc flights later this week to be canceled because of the storm. Hi Pablo . Has that Sturgeon attracted any local mates besides hungry Mc.m.Brits .I am a researcher and trying to credit some Sturgeon under or around Ross .